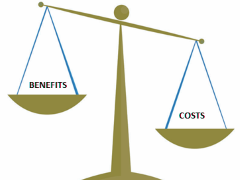 What is cost-benefit analysis (CBA)? CBA is a method of calculating the potential costs and benefits of a project or action which includes both the private costs and benefits and the external costs and benefits. CBA is mainly used by governments when deciding whether to carry out large public infrastructure schemes such as new roads. CBA enables governments to weigh up the costs and benefits of such projects and gives them an indicator whether or not society will benefit from them. Many people think that CBA delivers an efficient outcome. In economics an efficient outcome is one that is allocatively efficient which means it delivers the best possible outcome for society. CBA is useful in calculating the external costs and benefits of a project or action, not just the private ones. This means the actual impact on society can be calculated. CBA helps governments decide whether or not to carry out large public sector projects such as new roads or railways. As we live in a world of finite resources, CBA is a useful method of prioritising one project over another. If one project generates more social benefits and fewer social costs than other projects, it should be carried out. CBA also takes into account the opportunity cost of a project. For example, if CBA is used to help decide whether to spend public money on a new road, it will take into account the potential costs of the next best alternatives that have been sacrificed – in this case, the next best alternative might be investment on the railway. Why is it sometimes not useful? Many costs and benefits of a project or an action are very hard to measure and therefore hard to put a value on. The intangible costs and benefits of a project are often ‘imputed’ by economists which basically means they guess what their monetary value should be. However, imputation is not guaranteed to be accurate. Cost-benefit analysis cannot possibly account for all the economic impacts of a particular project. CBA will be able to account for the main costs and benefits of a project but there are many smaller-scale impacts that fall on stakeholders that are unlikely to be accounted for in CBA. Some people feel that using cost-benefit analysis doesn’t always bring a fair outcome on society. A large infrastructure project such as a new road may deliver more overall social benefits than social costs however there are still going to be people who live next to the road that are going to heavily disadvantage from it due to increases in noise and air pollution. On the other hand there will be people who heavily benefit from the road, such as commuters. When the costs and benefits of a project or action are distributed unequally across groups in society it is inequitable. Cost-benefit analysis is often accused of providing inequitable impacts. Some people feel there is a danger for CBA to value the economic impacts of a project, such as more jobs, greater than other impacts, such as the effect on the environment. CBA can may not put enough value on environmental degradation which has many intangible costs such as the loss in aesthetically pleasing views. CBA also doesn’t put enough value on individual impacts. It focuses on the overall social benefits and costs of a project rather than the impacts on the individual. Allocative efficiency – This occurs in a free market economy when resources are allocated in a way that matches the requirements of consumers to the greatest possible extent. Equity – This is when there is a fair distribution of income and wealth. External costs – These are the costs of a firm or individual using a product that are felt by third parties. An example of an external cost is pollution. Externalities – These are negative or positive consequences that are not accounted for in a market transaction. Examples of negative externalities are pollution or congestion. Imputed value – This is an estimate of the value of a good or service that isn’t sold in a marketplace and therefore is difficult to measure. For example, opportunity costs are often calculated using an imputed value. Private benefit – This is the benefit a firm or consumer receives when a good or service is purchased. Private cost – This is the cost paid by firms and consumers when goods and services are bought. Opportunity cost – The cost of the next best alternative being sacrificed; a trade-off. Social costs – These are the total costs of producing goods and services. Social costs are calculated by adding up private costs (such as wages) and external costs (such as pollution). Stakeholders – These are people who are affected by a particular business in any way. For example shareholders, customers and the government are all common stakeholders of a business.